The ability to communicate effectively in writing is an important requirement for graduation, and success beyond. Increasingly, graduates are also expected to problem solve in a collaborative, and often digital environment. Do you want to foster student’s future success while they gain critical thinking skills and increase their digital literacy? You can achieve both by giving your students the opportunity to work with 3D modeling and printing. Unsure of how to incorporate 3D modeling and printing into your curriculum? 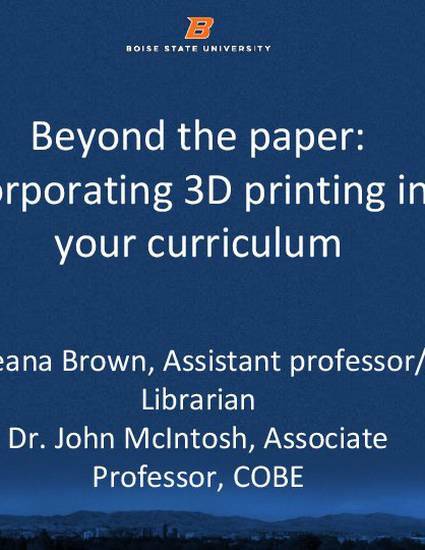 In this workshop, Associate Professor John McIntosh from COBE and Assistant Professor/ Librarian Deana Brown from Albertsons Library will explain the basics of how 3D printers work, share Professor McIntosh’s experience with a 3D printing assignment, discuss learning outcomes, and give you time to brainstorm ways you can incorporate 3D printing into your own curriculum. No prior experience with 3D printing or design is required, just an open curiosity.